There’s nothing more refreshing than a fruit infused water on a hot summer day. This Strawberry Detox Water is no exception. It’s thirst-quenching, revitalizing, and most importantly – delicious! Sweet flavors of strawberry combine with cooling cucumber, crisp lime, and fresh mint for a hydrating and rejuvenating detox water. Staying hydrated never tasted so good! Fruit infused water gets the name “detox water” not because of the fruit, but because the powerful effects a proper intake of water can have on your body. On top of boosting metabolism, hydrating skin, and increasing energy, staying adequately hydrated helps maintain proper kidney function. Your kidneys are responsible for eliminating toxins and waste from your body – without enough water our kidneys can’t properly flush our systems of these unwanted toxins. Fruit infused water is a delicious way to get your daily recommended intake of water to keep your body’s natural detoxification centers like the kidneys and liver functioning properly. If you want to take your detoxing and weight loss to the next level though then I recommend trying out these homemade detox juices! The fruit and vegetables in detox water isn’t only for flavoring though. They have a refreshing and cooling flavor that goes perfect in detox waters like this Cucumber Lemon Mint Water. Lime water is great for digestive health. The acidity helps stimulate saliva and digestive juices which aid in the breakdown of food. One of the best parts about this Strawberry Detox Water is just how easy it is to make! Just thinly slice the ingredients, add water, and enjoy! It’s extremely important to infuse your water in a glass container. If you use plastic the acidity from the fruits can break down the chemicals in the plastic and infuse them into your water! I like to make my detox waters in big batches so I have enough to drink throughout the day. Then I refill my glass pitcher with water and let it infuse again overnight. This way one recipe gives me about 3 days worth of delicious + healthy water! Glass beverage dispensers are perfect for detox water, but when I’m on the go I use an infusion water bottle – they’re great for small batches of detox water! 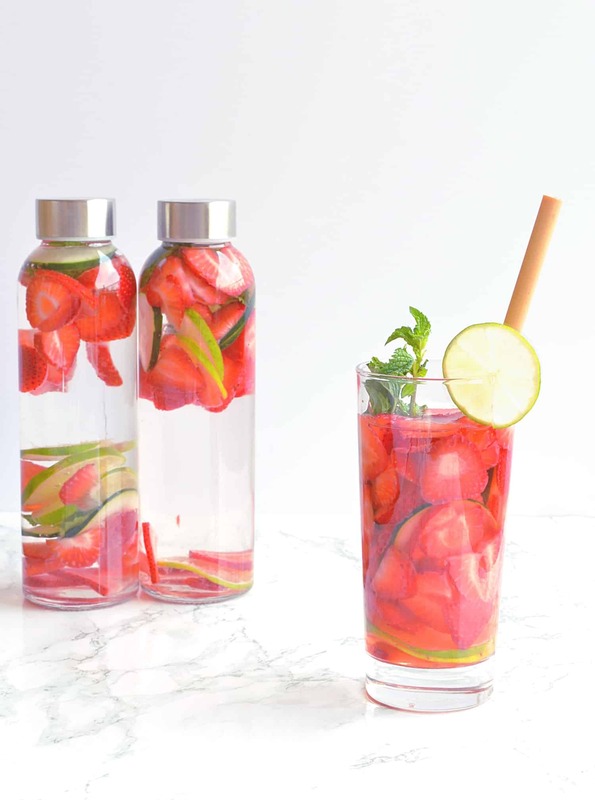 This strawberry detox water is the best of both worlds – healthy & delicious! But why stop here? There’s so many amazing detox water recipes you can try! Want more healthy and refreshing drinks? Check out this Watermelon Beet Energy Juice or this Tropical Anti-Inflammatory Green Smoothie! This looks so refreshing! Does it taste like strawberries? Thanks Nicole, it definitely is refreshing! The flavor is mostly strawberry with a little bit of lime, cucumber, and mint in there too! I tried this today! The strawberries with a hint of mint and lime tasted great! I actually drank more water than I usually do. Thanks for posting this recipe!